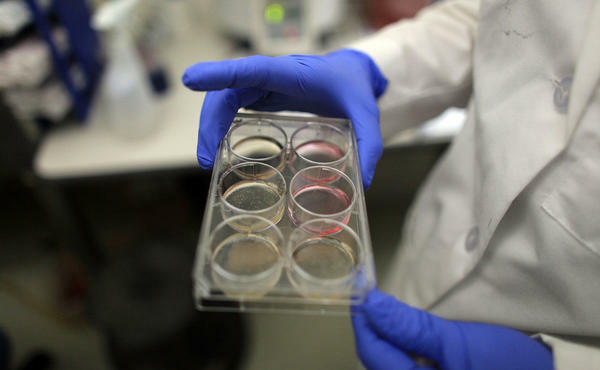 A scientist holds a tray of stem cells in a lab, in this file photo from 2010. A bill introduced in the Oklahoma Legislature has some folks scratching their heads, as it prohibits "the manufacture or sale of food or products which use aborted human fetuses." Since the bill was introduced late last week by State Sen. Ralph Shortey, a Republican from Oklahoma City, corners of the Internet have been buzzing with the news, as people try to figure out two things: 1) is this real; and 2) is there any reason the bill might be needed? News of the bill was first reported by the AP and The Daily O'Collegian, a student newspaper at Oklahoma State University. It sparked a lively debate in the O'Collegian's readers' comments section, which is connected to Facebook. The AP and the O'Collegian say that Shortey didn't respond to calls for comment. Two calls from NPR to the senator's office went to voicemail and were not returned. But Tulsa radio station KRMG managed to get in touch with him to ask about the legislation, Senate Bill 1418. The senator says that his research shows there are companies in the food industry that have used human stem cells to help them research and develop products, including artificial flavorings. "I don't know if it is happening in Oklahoma, it may be, it may not be. What I am saying is that if it does happen then we are not going to allow it to manufacture here," Shortey tells KRMG's Nicole Burgin. To that end, his proposed statute reads, "No person or entity shall manufacture or knowingly sell food or any other product intended for human consumption which contains aborted human fetuses in the ingredients or which used aborted human fetuses in the research or development of any of the ingredients." My own research suggests that Shortey may have noticed a boycott directed at PepsiCo, which since 2010 has worked with flavor research firm Senomyx to develop sweeteners and other flavorings. Based in San Diego, Senomyx has been accused of using proteins derived from human embryonic kidney cells in its research, which has been used by many large food companies. An article in the Miami New Times summarizes those claims, notes the company's denial of them — and also notes that in 2003, the company filed a patent for "recombinant methods for expressing a functional sweet taste receptor." That patent, for what is essentially an automated taste test, was granted in 2008. It mentions HEK 293, or Human Embryonic Kidney 293, a widely available cell line that was originally cultured in the early 1970s from a human embryo in the Netherlands. So, it seems that Sen. Shortey's bill mostly targets the potential use of stem cells in food research. But in the past decade, several attempts have been made to use animal stem cells to produce food. For instance, NASA has tinkered with using pigs' stem cells to grow "lab meat," according to a Popular Mechanics article from 2009. The article continues, "Today, scientists funded by companies such as Stegeman, a Dutch sausage giant, are fine-tuning the process. It takes just two weeks to turn pig stem cells, or myoblasts, into muscle fibers." And the group New Harvest has long been involved in the search for "meat alternatives," in the form of "plant-based meat analogs and cultured meat," according to its site. Shortey's bill was among hundreds submitted just before the state's Thursday deadline, as Oklahoma legislators vied to get their bills entered for discussion in the upcoming session, which runs from Feb. 6 into late May. Thanks to NPR Southern Bureau Chief Russell Lewis and KOSU's Rachel Hubbard for flagging the story.